My dad me a 68 beetle deluxe. I was king of the road. No heat or defrost. These are all very informative and entertaining anecdotes. Siamese cats and "yum, yum, yum..." One of the members mentioned a small rear, oval, rear window which inspired my memory to recall the earliest memory I have of sitting on my knees in the back seat of my parents VW, with my younger brother and sister looking out the rear window. We were living in Germany and I believe the year was 1966/67. I was 4 years old. Interestingly, we were not fastened in with seatbelts. Did they have seatbelts in VWs during that period? We had a '64 Beetle we were towing when we moved to the Baltimore area around that time. It was the first time we'd ever encountered toll roads and didnt realize we had to pay a toll for the towed Bug, too! Couple of miles down the road, got pulled over for it! Later had a Beetle that I nearly killed myself in when I was a new driver -- drove it too fast around a gravel-lined road on a bluff. Started sliding off the road and over a cliff, but, luckily, there was a tree there that kept the car from going over. Helluva bang, though! 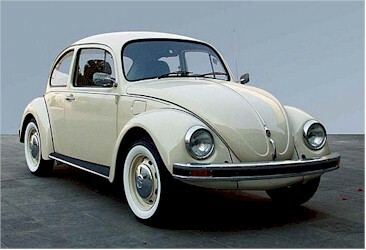 My father had a '64 white VW beetle, that was his "fun" car. His "serious" car was a burgandy '64 Oldsmobile Vista Cruiser station wagon. Back in the day, me and dad would tool around Orange County, CA just for the hell of it in the VW. Ah, those were the days. An ad for the VW Beetle in 1967 gave $1500 as the cost for the car. It might as well have been $15,000.00 as far as I was concerned. Back in the 1950's in Plainfield NJ, I knew a large family that had an early "Beetle" as a second car. It had an oval rear window that was no larger than a contemporary rear-view mirror. It had no electrical turn signals, but instead, had a gizmo that the driver operated manually, Pointed horizonally, it indicated a left turn, and set vertically, a right turn. It also had no fuel indicator on the dash, but had a manually-operated lever that opened a very small reserve tank once the driver sensed that the somewhat larger fuel tank was getting down to "empty". More than often, one of the drivers would forget that he or she had put the reserve tank in operation, causing the car to run out of gas completely if the next driver didn't note the position of the lever. The newest Volkswagen Beetles look very much like this. The guy who would pick up our male Siamese cat to go yum, yum, yum with his female Siamese drove a VW Beetle. From then on, anyone who visited us in their VW would find our male Siamese cat in their Bug, ready to go make yum, yum, yum!